Let me first say, if you don’t own Veganomicon, you NEED to! Vegan or not, this cookbook is filled with tons of recipes for all to enjoy. We’ve been slowly working our way through them – we’re guilty of getting stuck in routine and eating a lot of the same meals – especially when you find a good one! 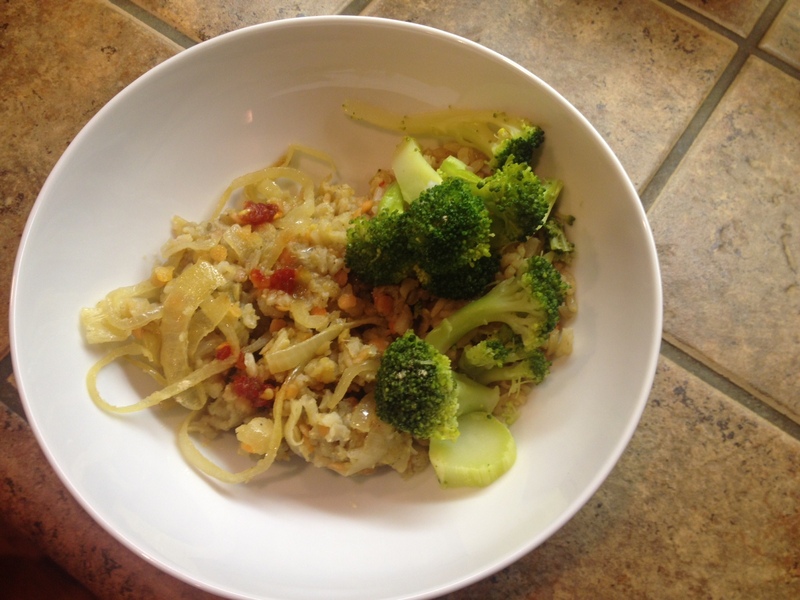 Last night we tried a new recipe and I thought I’d share it with you…and include some pictures, since that’s the one thing that’s missing from Veganomicon. I love to see what the final creation is supposed to look like! 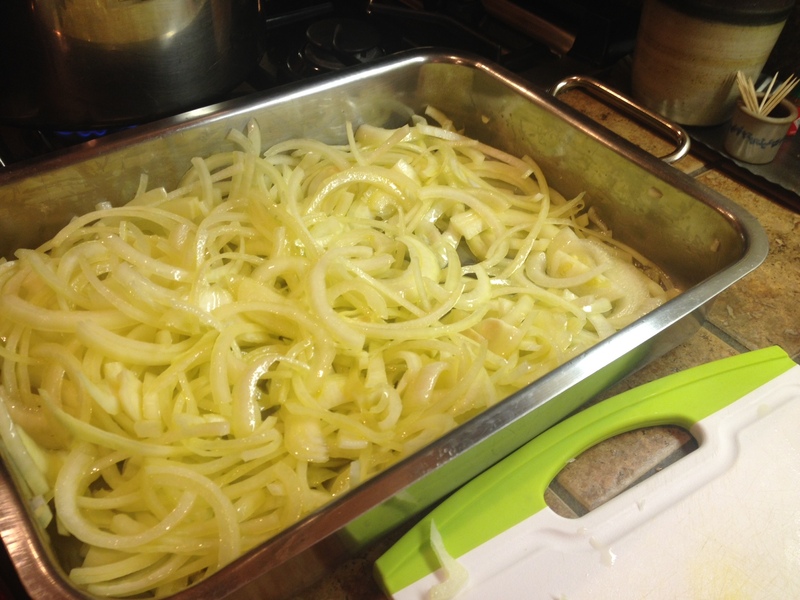 Toss the sliced onions with the olive oil in your roasting/baking pan – try to spread them out as best as you can. Bake in the oven for approximately 25-30 minutes, stir them frequently to ensure that they cook evenly. You’re looking for a deep brown color and somewhat crisp. It took us much longer than the time they suggested – we even raised the temperature and it took about 45-50 minutes…I’m thinking it’s our oven! While the onions are cooking, bring 4 cups of water to a boil in a large pot. Once the liquid is completely absorbed, remove the pot from the heat and let it sit for an additional 10 minutes (leave the lid on). 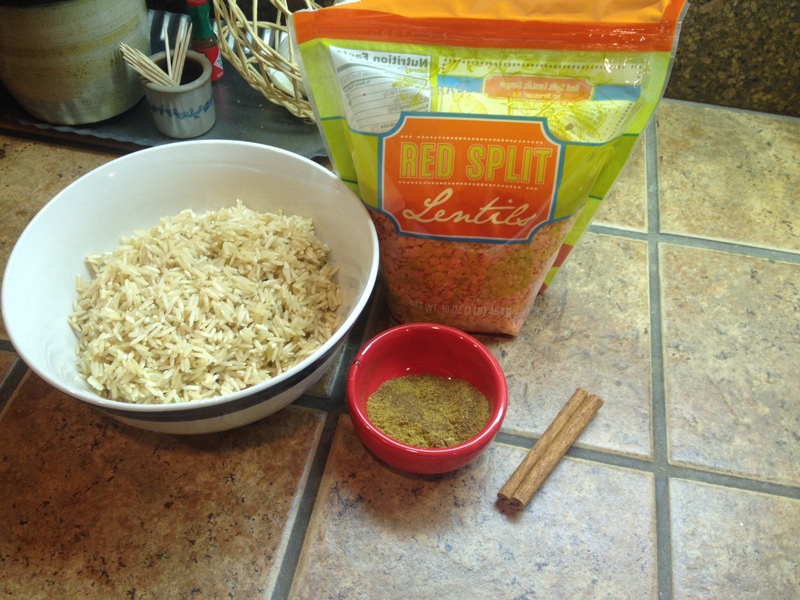 Next, fluff the lentils and rice with a fork and remove the cinnamon stick. Gently fold in the caramelized onions. 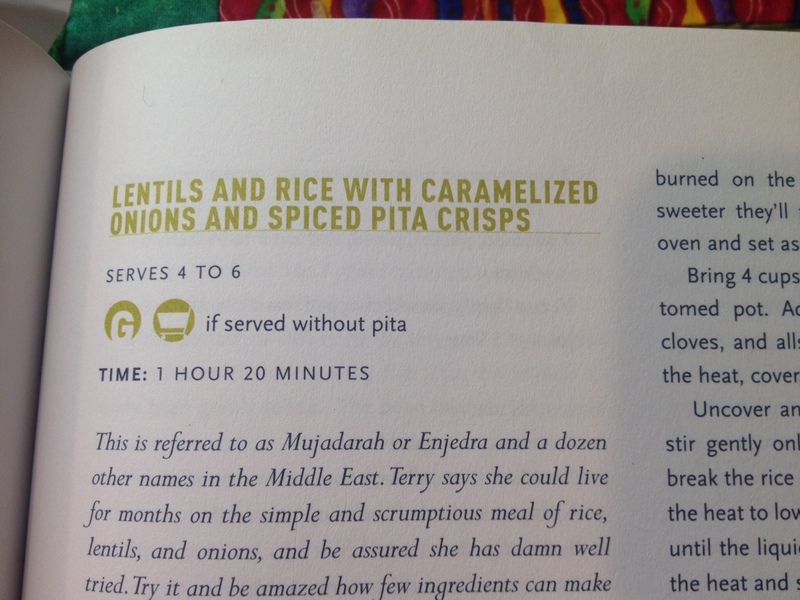 The original suggestion is to serve this dish with their spiced pita crisps, but since I’m gluten-free, we chose to steam up some fresh broccoli instead. We all thought this meal was really good, but also felt it needed a little salt and some extra seasonings. 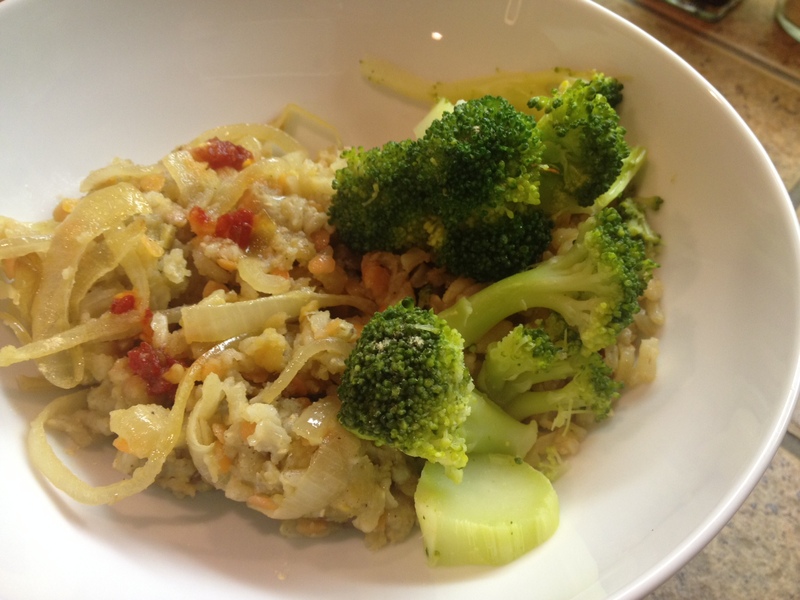 We all doctored it up in our own way – some of us added hot sauce, shallot salt, Trader Joe’s 21 Seasoning Salute (our go-to for most meals), and coconut aminos. I LOVE caramelized onions, but I feel it’s much easier to prepare them in a pan over the stove…not to mention I would use a lot less oil. To me, it’s easier to keep an eye on and make sure they’re cooking evenly – this way you’re not constantly opening the oven to stir. Next time I would quarter the onions and then slice them – we felt the onion slices were too big and some weren’t cooked all the way through. I felt this recipe was simplistic in that the ingredient list was so short, but it took much too long. There were some large clumps of rice and lentil that might have been a result of not letting the liquid completely absorb. In my experience, lentils don’t take very long to cook and rice cooks faster and more evenly in a rice cooker…so next time I think I would cook them separately (spices with the lentils) and then fold it all together. I promise, this recipe is very good, but when you’ve got a toddler running around, we’re always looking for simple and efficient! So, try it and let me know what you think!